Surrounded by a pest proof fence, this is a great place to get into the bush and escape the noise of the city while trying to spot lots of native birds. Even with noisy kids, you should spot something! Walks of lots of different lengths are possible with various stopping points/distractions en route like, Weta Motels, trying to spot native geckos, feeding stations and a bird call area (where you can press a button to hear the different types of bird calls). Enough to hopefully keep even small children walking in at least one direction! It’s buggy friendly on most of the main tracks. Pick up a map with feeding and talk times on it at the entrance and look at the board for where the tuataras have been spotted that day (the numbers refer to the fence post numbers). The 2 Takahe are generally easy to spot in their wetland area and if the boat is running, it leaves from near here to return back to the start of the sanctuary – a great reward if your little ones have walked a long way! The Sanctuary is often sheltered from Wellington winds although it can be chilly in winter months until the sun gets over the surrounding hills! Take extra layers, or in the summer make sure you have sun hats and sunblock for the sections of track that are not shaded by bush. It’s worth noting that there are only toilets in the Visitors’ Centre and then in the sanctuary near the Tuataras. Rata Cafe is a destination in itself as it’s very family friendly and has good food and coffee. There are games, books, colouring in and a fenced off toddlers’ area in the main Visitors’ Centre. 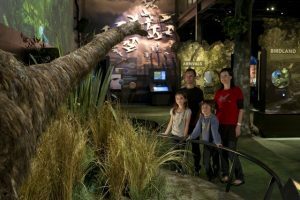 If the weather turns while you’re there, rush back to the exhibition area in the Visitors’ Centre which has interactive displays about NZ native animals including the Moa. If you already know that you only want to visit the exhibition, you can buy a half price ticket just for that. Warning: The film which screens on a loop on the main screen can be quite scary for kids as it’s all about how the Moa were hunted to extinction and the screen covers a huge wall which makes it particularly scary for some kids. Photo credits: Life size Moa at ZEALANDIA Exhibition – Zealandia. Address: Waiapu Road, Karori. Approximately 10 minute drive from the city centre but there are also free shuttles travelling from the I-Site on Wakefield Street and the top of the Cable Car on Uplands Road, Kelburn. Karori is also well serviced by public buses from the city centre, although the main road is about 500m from the sanctuary. Check here for routes and timetables. Open: daily 9am – 5pm (last entry 4pm). Closed Christmas Day.